Airbag - Driver,Airbag - Passenger,Air Conditioning,Anti Theft System,AM/FM Radio,CD Player,12V Power Outlet,Four Wheel ABS,Front Disc Brakes,Cruise Control,Rear Defrost,All Wheel Drive,V6 Cyl. Engine,Floor Mats,Fog Lights,Gas,Auto Delay Off,-,Remote Keyless Entry,Power Locks,Luggage Rack,Power Mirrors,Vanity Mirrors,Fold Down Rear Seat,Front Bucket Seats,Tilt Steering Wheel,Power Steering,Tires - Front All-Season,Tires - Rear All-Season,Wheels - Aluminum,Power Windows,Intermittent Wipers. 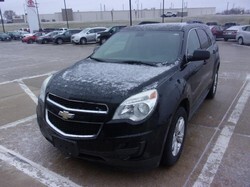 Hello, I would like more information about the 2005 Chevrolet Equinox, stock# 23944a. Hello, I would like to see more pictures of the 2005 Chevrolet Equinox, stock# 23944a.